At the end of April, Microsoft announced that Microsoft 365 Business will be getting robust security features previously only available to Office 365 enterprise users or users with security add-on features. The two most notable additions are Office 365 Advanced Threat Protection and Data Loss Prevention. Office 365 Advanced Threat Protection (ATP) limits your users’ exposure to malicious content. It scans emails for links and attachments containing ransomware and other malicious content before letting them into your users’ inboxes. It also works with programs like OneDrive and SharePoint to scan content to keep malicious files out of your company’s cloud environment. ATP has become one of our top security recommendations for all of our Office 365 users, so we’re happy to see that it will automatically be included in Microsoft 365. Data Loss Prevention (DLP) is a set of policies to keep sensitive information from leaking outside your company. It works by identifying sensitive information like social security numbers and preventing them from being sent out. You can use prewritten formulas and policies set to meet regulatory requirements or set your own policies. If you’re not using Microsoft 365 yet, both of these can be added to Office 365 plans. At Build, Microsoft announced several new product features that will allow users to seamlessly switch between devices. Timeline is a feature that shows your history in documents, emails, and web so you can come back to it later. That doesn’t sound like much on its own but here’s the exciting part: it’ll work with your mobile devices, so you can start writing an email on your phone, and pick up later on your computer. Ars Technica has more. Microsoft also announced that a feature allowing you to easily share text messages, notifications, and photos from your mobile phone to your computer. The example shown off at Build was dragging and dropping a picture from your phone into a Word document on your computer. These features aren’t live yet, but we’re looking forward to general availability. In the past, Microsoft has been a Windows first company and for a long time, pushed a closed system. That has been changing in previous years, as they’ve embraced other platforms and focused more on letting users work on whatever device they want. More recently, much of their commercial product focus has been making systems work together across devices. We don’t see this slowing down any time soon. Microsoft tends to make big product announcements at their conferences and Inspire (their conference for Partners like PTG) is only a couple months away. 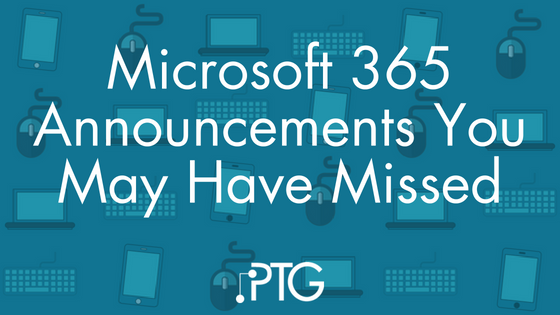 We wouldn’t be surprised to see some more Microsoft 365 announcements come out of that. Stay tuned.